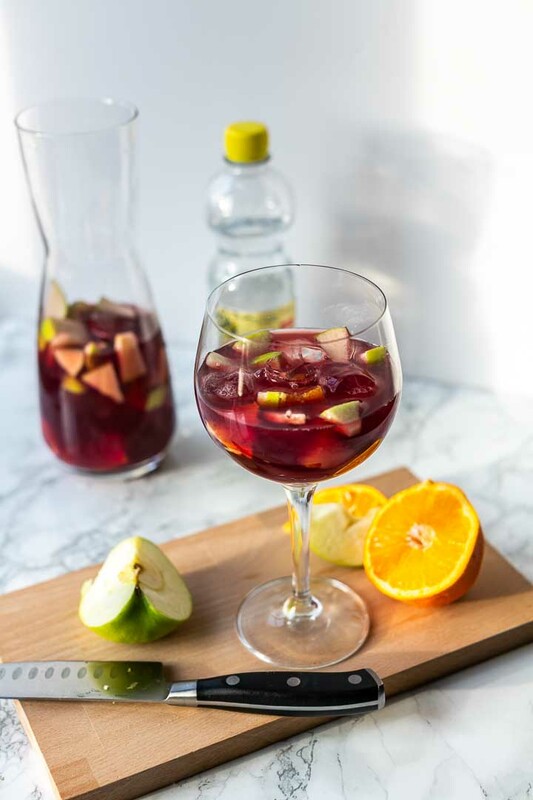 Sangria originates from Spain and is a red wine drink combined with chopped fruit, brandy and some juice. Fruit and wine is a great combination especially if you let it sit in a pitcher and let it cool. 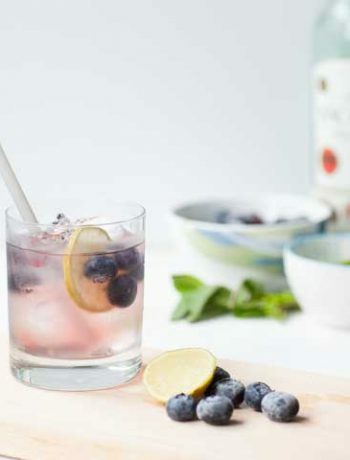 This recipe is easy to make this drink ahead of time. 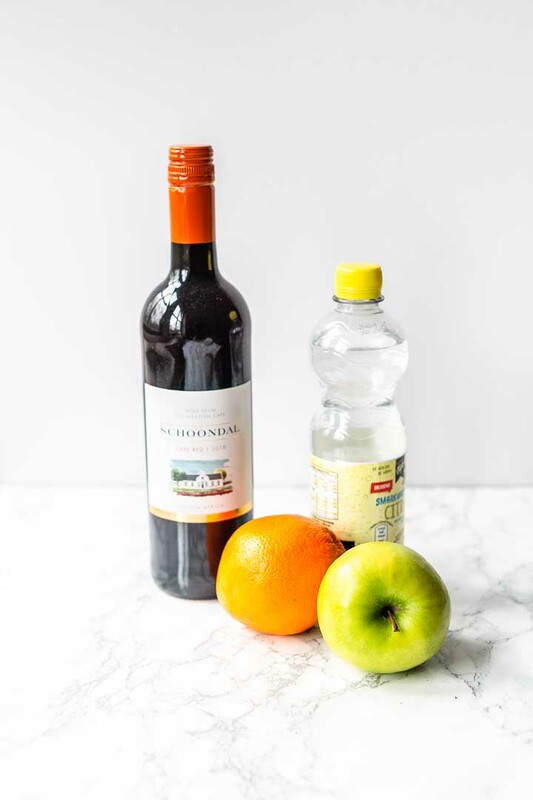 You can leave your sangria in the fridge over night but be prepared to have a much stronger tasting drink. 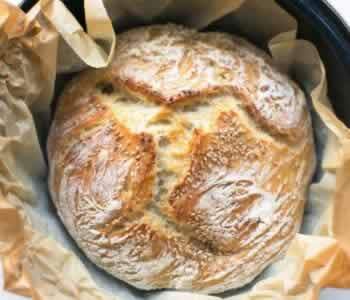 Serve on warm weekend afternoons or at your next party. Make a big pitcher because this will be gone in no time. What fruit goes in sangria? If you are wondering what fruit goes into sangria you have lot of options. 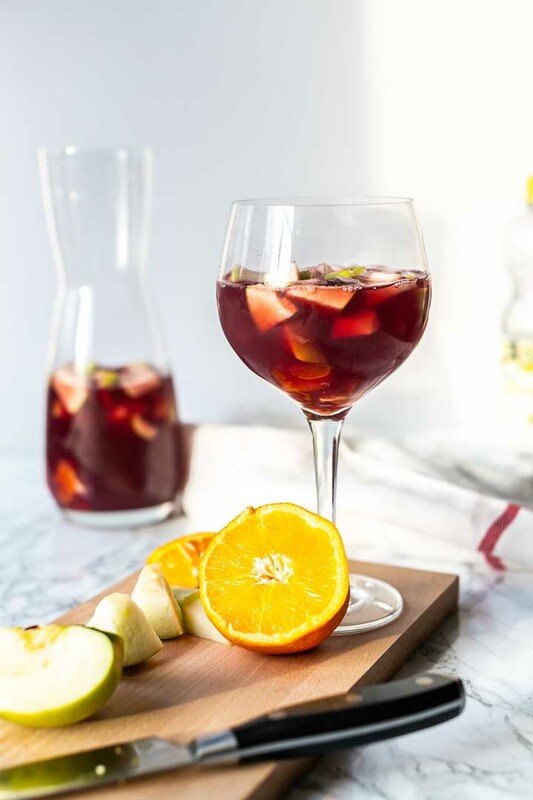 In a traditional sangria you only use red wine, green apple and oranges. Sparkling cava – which is used in Catalonia to make there own version of sangria. If you use Cava you can leave the sparking water out of the recipe as you have enough bubbles from the Cava. 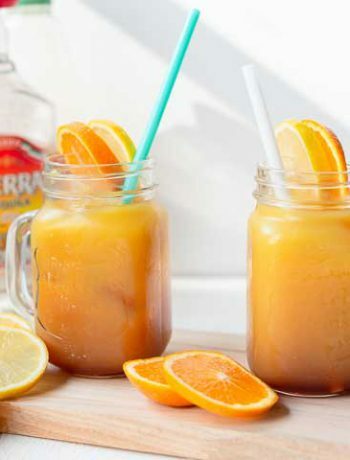 Wash your apple and orange with some cold water. Leave the skin of the apple on and dice it in big chunks. Slice your orange and cut it in triangles. Put the fruit in a big pitcher. Then add the lemon juice, orange juice, brandy and the wine. Take a large spoon so you can stir all the ingredients to combine. If you do not have brandy you can easily substitute with some rum. 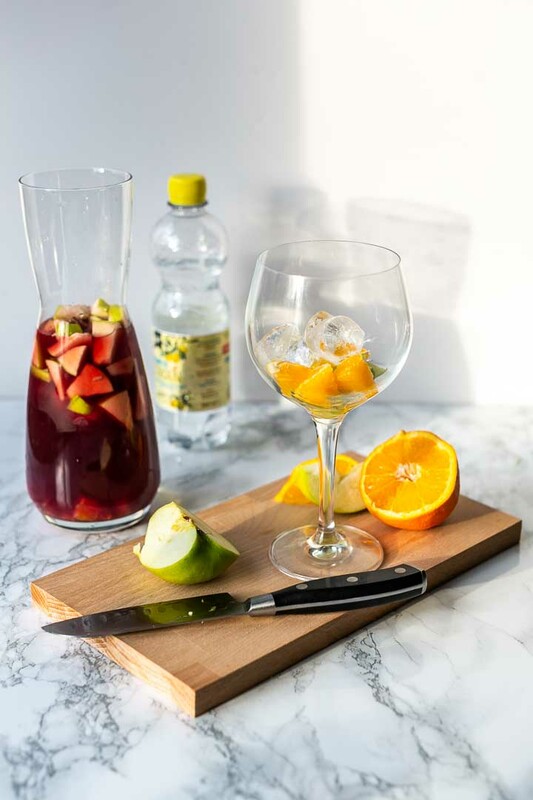 Serve your sangria with big wine glases and with a wooden spoon so you can scoop the fruit out of the pitcher in the glass. 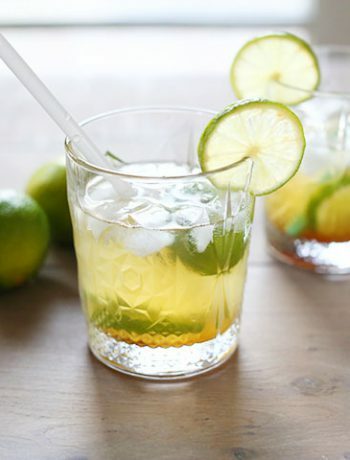 Caipirinha – sweetened with coconut sugar and made with limes. 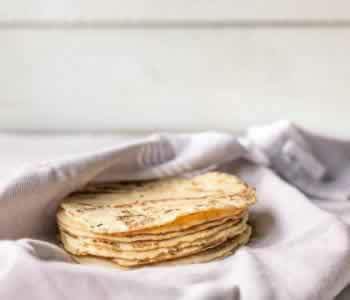 Made a recipe please tag @thetortillachannel on INSTAGRAM, PIN on PINTEREST and like us on FACEBOOK for more information and updates. 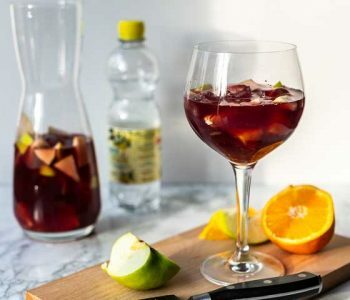 Looking for an easy authentic sangria recipe? 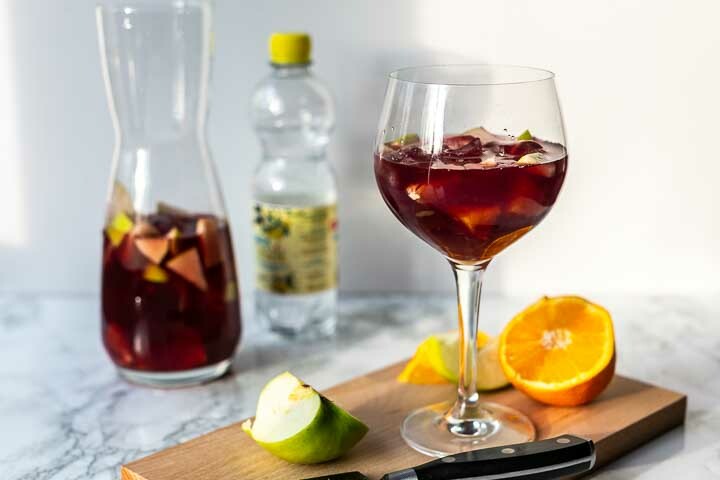 Take a look at this how to make sangria recipe. You only need 7 ingredients. 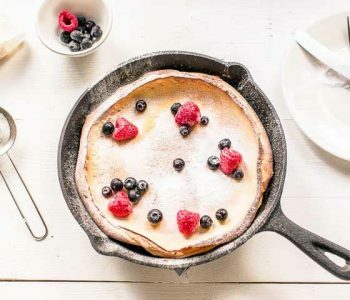 Glad to read you like this recipe. Have fun making it!